The surprises are the best. These are not the places that you have heard about, and long to visit, and then finally had an opportunity. They are the places that you have never heard of, that you did not know existed, and that you stumble across. These are the hidden gems, the best kept secrets that are not secrets. Such is the case with the broom factory, a museum/storage facility/workshop. It even has the kind of beginnings that many of us gearheads would appreciate, being the idea of a few guys who got together around a common love of enduro machines from Spain. These are guys who restored and used and maintained the machines. They did, and still do, vintage race some of them. With too many machines and not enough place to store them, they found a willing host in a building called the broom factory. It is a fascinating old building which has been converted to offices and shops, and is a great story in it's own right, but that is not why we visited. I eventually get Mike Slate on the phone and he drives there from a half an hour away. Once he opens the door, you begin to understand. It opens to reveal a single large room packed with vintage enduro bikes. They are mostly Ossa and spanish rival Bultaco, but they also include Pentons and a ????. Almost all are complete running motorcycles in good condition. Many are fully restored. Some are survivors. All make you want to put ona 3/4 helmet and enter the next vintage hare scramble. You would think that a theme centered around Spanish and euro bikes from the 60s and 70s would be enough, but this facility is very much dedicated to local activity, local shops, local tracks, and local heroes. The machines and the memorabilia chronicle this type of racing in the mid Atlantic area going back 5 or 6 decades. 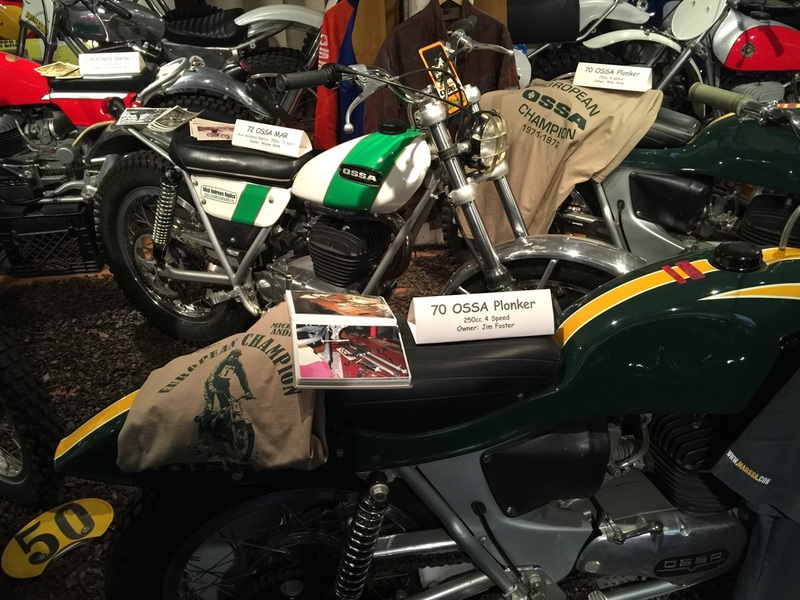 You can see pictures of the parents of the guys currently involved, on some of the bikes in the museum. A truly interesting and revealing perspective on the grass roots level of the sport. And then there are the bikes. Rare machines that we forgot existed, and pristine machines that were everywhere back in the day. Great color schemes and racing frames and weight-saving tricks from a time past, mixed with factory machines that were surprisingly competent then and fun even today. 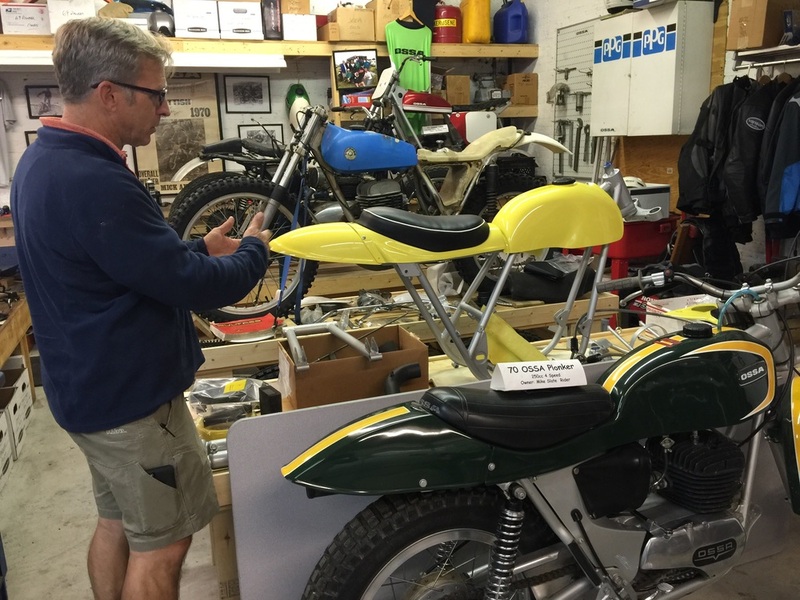 If Ossa and Bultaco are your passion, this is drool city. But wait, there's more. Mike leads the way to another equal size space on the floor above. It is almost as full, but houses Triumphs, and BSAs, and a Moto Beta, and a Parilla, a Greeves, a Yankee Z, and an Ariel Square Four, and a few Harleys scattered about. The enduro theme still holds, but with a more eclectic collection of machines. There are show-winning machines on both levels. The old wood floors, the exposed rafters, and the painted brick make both spaces into a pleasant space to spend time. You would almost like to sit for a while and just admire all that surrounds you, but there is no room for a chair !